The Takeout’s story yesterday about Starbucks’ new line of blandly festive holiday cups appears to have generated a considerable amount of conversation. We alluded to prior Starbucks cups controversies, like last year’s multicultural mural, and 2015’s famously divisive two-tone red version. In the comments section (a treasure trove on this particular story), many wondered whether those red cups were actually controversial, or is was rift overblown in hindsight? Revisiting this seems especially appropriate today as Starbucks is releasing a new red cup, now in a reusable format. A little digging reveals that yes, red-cup hate was a thing, although it stemmed from a fairly small faction. It was mainly fueled by evolution-dismisser Joshua Feuerstein, who ranted against the godless red cup in a YouTube video that received 14 million views. Breitbart unsurprisingly then spoke out against the “war on Christmas,” as then-prospective presidential candidate Donald Trump promised he would usher in the return of “Merry Christmas” (like it ever actually went away). 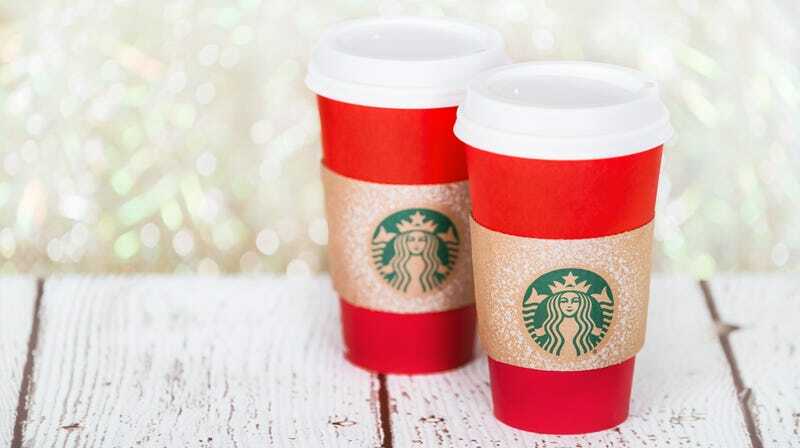 Vox points out that the ensuing controversy erupted in 2015 headlines like “The phony ‘War on Christmas’ is back, fueled by those alleged Jesus haters at Starbucks” from The Washington Post, Us Weekly’s “Starbucks’ Plain Red Holiday Cups Are Causing Outrage Among Christians,” and Jezebel’s “Christians Angry Over Starbucks’ Minimalist Holiday Cup Design.” And some critics just didn’t like the red cup because it was too plain. At any rate, it seems like a ridiculous amount of effort spent by some over the color and design of a Starbucks cup. So we welcome today’s return of the red cup in an environmental, reusable format. You can get the cup for free today, November 2, with the purchase of any of the chain’s holiday drinks, like Peppermint Mocha, Toasted White Chocolate Mocha, Caramel Brulee Latte, Chesnut Praline Latte, Gingerbread Latte, and Egg Nog Latte. CNBC notes that these holiday-drink releases are at least a week earlier than previous years, and the kickoff rush may have resulted in the Starbucks app going down today. Once you have the reusable red cup, it’ll get you 50 cents off of any grande-sized beverage purchased after 2 p.m. until January 7. If you miss the free beverage holder today, it’ll be available for only $2 afterward. Finally, a red cup we can all get behind.